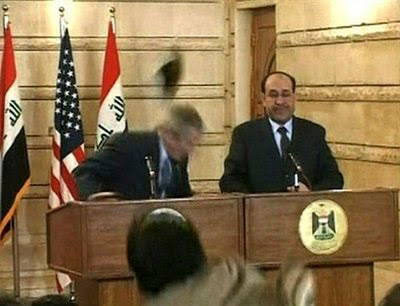 An Iraqi reporter threw his shoes at Bush during a press conference yesterday in Baghdad and called him a "dog". In most Mid-East cultures, showing someone the soles of your shoes is considered the ultimate - and often mortal - insult. You know what I can't help but think about this incident? Theodore Roosevelt was once giving a speech and someone tried to assassinate him. The bullet hit something in Roosevelt's chest pocket, didn't penetrate his body at all. T.R. jumped off the podium and commenced to beating the living crap out of the assailant with his bare hands. Now how come "tough guy" George W. Bush didn't do something like that yesterday? Forgive him...it will teach him a lesson. I thought he did a pretty good job dodging the shoe. It is ashame he is leaving. Oh yes, if he attacked the shoe thrower that would have really shown some class. Why does it come as no surprise that the third comment above apparently came from, once again, Berean Baptist Church in Winston-Salem? Those people would still worship Bush even if he were caught in bed with either a dead woman or a live boy. And what would they know about "class" anyway? They have no problem with attacking anyone else. Now how come "tough guy" George W. Bush didn't do something like that yesterday? Because that was a different time that you're comparing this incident to. That was a time when people wanted the president to be a leader and not take any crap. Can you imagine if Bush really did go after the person who threw the shoes? A PR nightmare would commence. That's the problem this country is facing with public relations; we're just too nice now. Once upon a time an act like that would have invoked anger and vengeance from the American people that their president was so treated. Most Americans are laughing at Bush instead of being angry for him. This proves one thing. Bush has not lost the moves he had as a cheerleader. Biggest surprise is how slow the Secret Service responded. A well placed shot and that second shoe would have never been heaved at his head. Kinda reminds me of the Villon in the spy who shagged me that threw his hat.